Today I got up at 5:30 am to try a little striped bass fishing in the Raritan Bay. This means trolling - and I hate trolling. Unless it results in catching a lot of really big fish. Well, I'm going to cut to the chase on this report. . . Boooooo! I went out with Pat and despite having a nice time we were not successful. 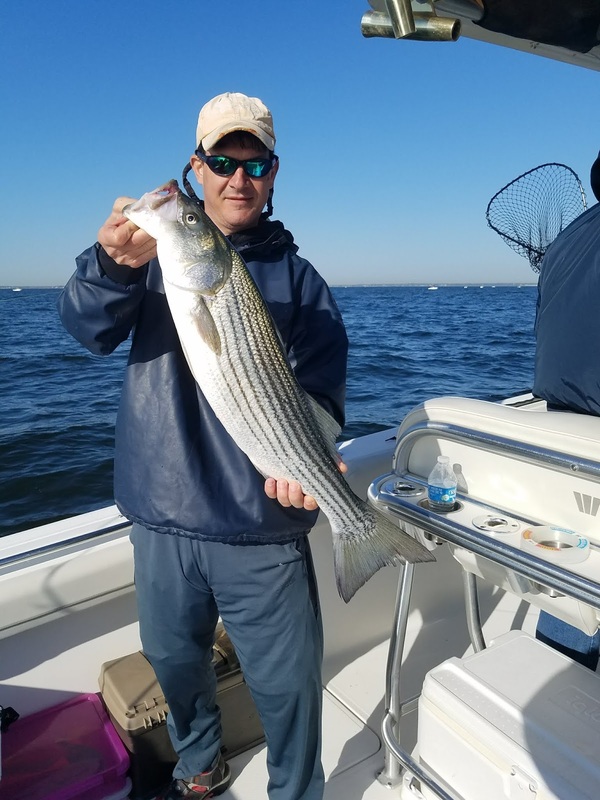 We did manage one small striper but with all of the positive reports and all of the other boats fishing and the good weather, we should have landed a lot more. We saw many positive marks on the fishfinder but the fish just were not biting today. I had to quit early because of tennis practice but I don't think we would have been successful even if we stayed out longer. Tennis was a good workout - good enough to work off the three donuts that I ate on the fishing trip (thanks Pat!). I spent the rest of the morning into the afternoon working on the garden irrigation system (a never ending project) which is finally coming along nicely. The neighborhood kids were around in the afternoon and asked me to take them fishing. It was the maiden voyage for my boat this season - something always goes wrong on the maiden voyage. However, we went out for an hour, did some fishing (*not catching) and the boat ran perfectly. Nothing went wrong - to my surprise. Although we didn't catch any fish, this was a positive trip. Took Jamie to Giannis for dinner and watched Survivor on TV. That's about all the actual 'surviving' I did today - watched it on TV. Oh well.